Basil Rathbone is absolutely despicable as the hard, cruel, abusive stepfather. A wonderful performance, that causes the audience to absolutely despise him. Mr. Murdstone (Basil Rathbone): If I have an obstinate horse or a dog to deal with what do you think I’d do? David Copperfield as a child: I don’t know. Mr. Murdstone (Basil Rathbone): I’d beat him. I’d make him wince and smart. I say to myself, “I’ll conquer that fellow”. And if it were to cost him all the blood he had, I’d do it. 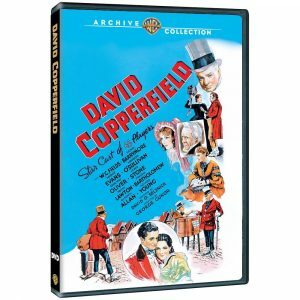 Mr. Micawber (W. C. Fields): Copperfield, at present, I have nothing to bestow but advice. Still, that advice is so far worth taking. I have never taken it myself, and am the miserable creature you behold. Young friend, I counsel you: annual income, 20 pounds. Annual expenditure, 19 pounds. Result? Happiness. Annual income, 20 pounds. Annual expenditure, 21 pounds. Result? Misery. Farewell, Copperfield. I shall be happy to improve your prospects, in case anything turns up – which, I may say, I am hourly expecting.